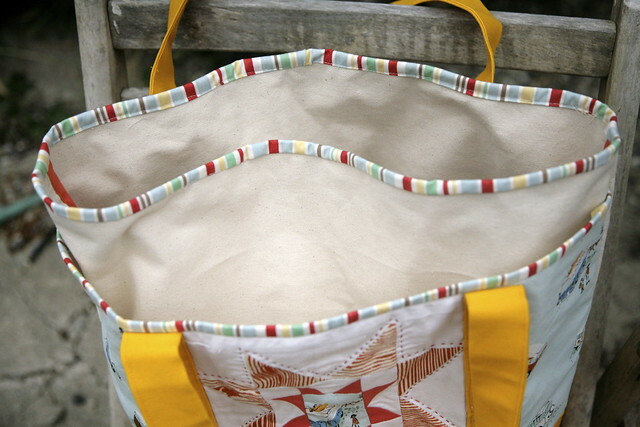 Inder Loves Folk Art: A Few of My Favorite Things: the Nova Tote. After the challenge of Maggie's backpack, I was ready for something easier and more fun! But I wasn't sure I wanted to do another bag. Like, ever again! So when my buddy Mahriam a.k.a. Three Owls Handmade asked me to test her new Nova Tote pattern, I initially hesitated. But then Mahriam kept talking about how easy and simple it was to construct as well as parading out amazing versions made by her and her other testers, until I broke down under the pressure! And she was so right! This bag completely cured me of my "I hate sewing bags" mindset. Picking fabrics for this bag was so fun. I bought the canvas especially for this project, but everything else came from my stash. 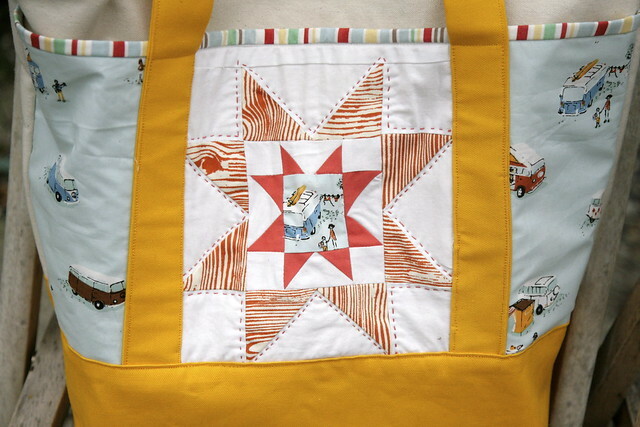 This bag has so many of my favorite things - golden yellow, Heather Ross VW vans, quilted stars, striped binding, orange wood grain fabric, hand embroidery. It kind of makes me want to break out in song! 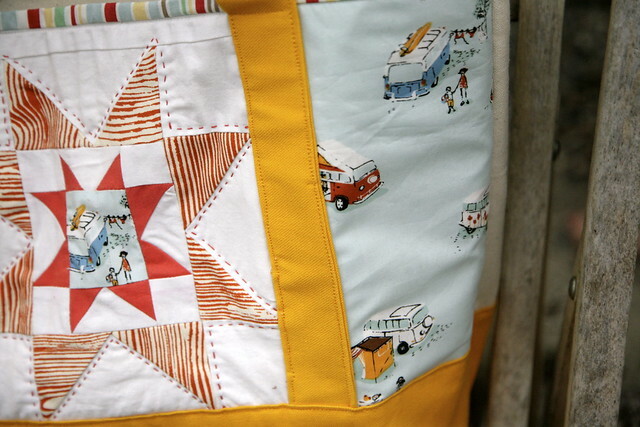 I got a little nervous cutting into my precious fat quarter of VW buses - it was a gift from another sewing buddy, and it might well be the most valuable fabric I own from a collector's perspective. But now I can enjoy it everyday, and I still have plenty left. Fabric is meant to be sewn, right? Making the quilted star panel was the most challenging aspect of the bag for me, since I'm only an occasional quilter. I required a bit of hand-holding from Mahriam on that part, since I had to learn how to make "flying geese" using only squares and rectangles. She has since added more detailed instructions on that technique in the instructions - it's one of those techniques that not immediately intuitive but once you "get" it you can't imagine doing it any other way. Once I figured it out, it was really fun! My points aren't perfect and my star is a little wonky, but since I'm not a hard-core quilting perfectionist who measures self-worth by triangle points, all I see is ORANGE WOOD GRAIN AWESOMENESS. Haha. I did add a little hand-embroidery in lieu of quilting, just because. The front pocket is big and deep enough to hold my keys and wallet separately from my other things without falling out. 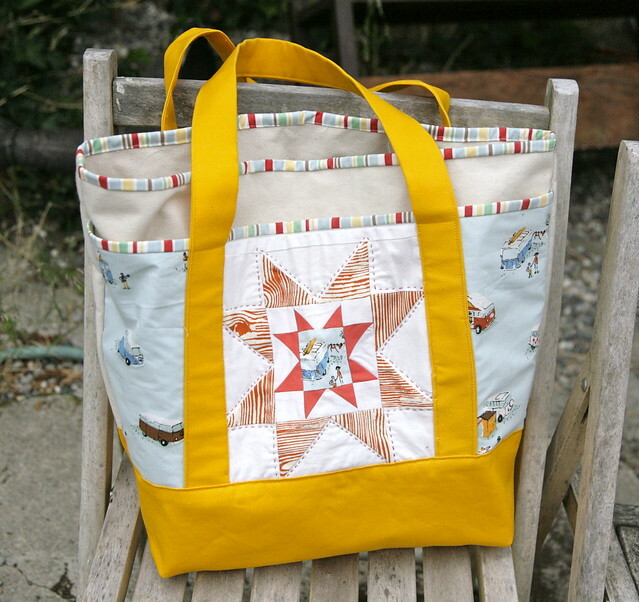 The construction of this bag truly is simple and fast, making this a great first time quilting project for an apparel sewer or, I imagine, a great first time sewing project for a quilter. All of the pieces are rectangles, and it goes together without a lot of fuss. My only suggestion would be to use a really nice heavy denim needle in your machine and go slowly - I broke two needles in my rush to sew through four layers of canvas! But even so, this was an afternoon project. Once the quilted panel was completed, the rest of the bag was done in a jiff. Since I opted not to line the bag, I finished the inside seams off with some bright tomato red bias tape I had in my stash. The main body of the bag is actually two layers of canvas, so in theory it could be self-lined, or you could line it with a cute contrasting fabric. Next time I will probably add an inner pocket or two, preferably with a zipper to keep my keys safe, but as far as easy breezy beach bags go, this is exactly right as-is. As you can imagine, this bag went immediately into regular rotation and is now my go-to tote bag when I am running errands! I want to make the medium size next, and I'm excited that Mahriam is working on a quilted lunch bag that would be perfect for taking leftovers to work (I am currently using a five year old Cost Plus reusable bag that has really seen better days, so I could use something just like that). It's exciting to see my friends designing patterns! Right now, I don't really feel any desire to learn to design or sell patterns, but I sure do enjoy testing them (when it works with my schedule and desires and usually in exchange for a copy of the final pattern). Ha, it works out just perfectly, right? Excellent symbiosis. 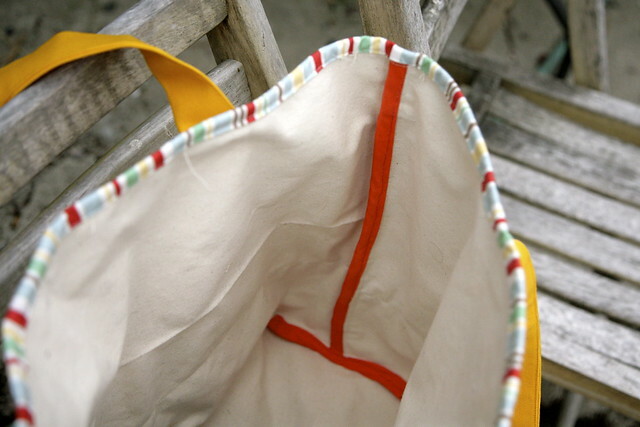 Are you considering making a Nova Tote? Do. It. It may change your mind about bag-sewing. And if not, you'll still have an awesome tote. Inder, I LOVE your Nova Tote! Glorious yellow and JD woodgrain!!! Thank you for making the time to test my pattern and writing such a thoughtful post! What a great bag Inder, I have hesitated but I should make one, we have a no plastic bag rule in our state so we take our canvas bags to the supermarket! PS If you are broad minded Google Tim Minchin Canvas Bags. I love the fabrics that you chose for those bag (especially the precious ones!). They all go so great together! Love this! BTW: if there was a plastic bag ban here, I would die. I use about 4 a day for cleaning up after my animals and I never have enough! I'd have to actually buy poo bags! Inder, if only you knew how much I laughed (literally out loud) at the statement about measuring self-worth based on triangle points. I'm still laughing actually. You are hilarious! And I love your bag! That bag is fantastic. I love all the fabrics you chose. I really like sewing bags but haven't made one for me for what seems like a long time.